Once upon a time, there are four shining candles in a room. They are red, green, blue, and white candle. As time goes by, they are slowly begun to melt down. In the quiet night, was heard their talks. The white candle said, “I am a peace. But unfortunately more and more people are not able to keep me even longer to appreciate the meaning of Peace. Therefore, I’d better just turn myself off” So little by little the blue candle goes out. The green candle then said, “I am faith. But like the white candle, I also have the same fate. This time, there are many people don’t have faith anymore. Though they claim to have me, but sadly they place me at the bottommost of their lives. Not infrequently they sacrifice me solely for their own interests. It’s useless for me to keep light up. I will follow the blue candle!” Slowly the green candle dimmed and finally disappears. With the sad and pessimistic feeling the blue candle also said, “I’m a love. But lately I often ask to myself, if love is still there? I feel people no longer look at me and think I’m useful. Today, the world is full with hatred. People hate each other. Love in human being is already fading. So I think there’s no point I am keep shining.” Soon, the light of blue candle goes off too. 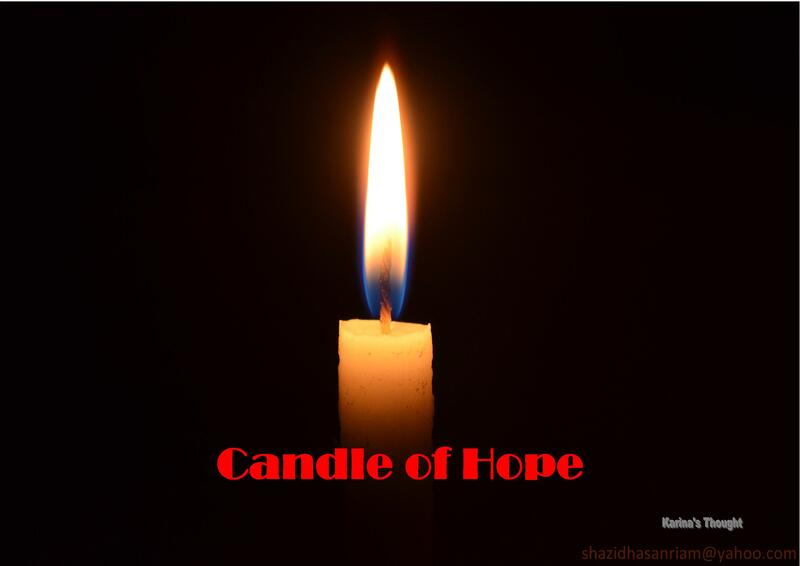 There is one remaining candle that still shinning, the red candle and the room is getting darker. Suddenly, there is a little girl get into the room and she immediately fears because of the dark room. “Oh no… what is going on with you, candles? I am afraid of darkness. You must keep shine up and brighten this room!” She begins to crying. These verses vividly show us where we should to put our hope in this life. There is only one in this world that can be our hope; He is God in the name of the Lord Jesus Christ. God is source of hope and through Jesus Christ He gives us hope. My dad finally made it through a critical period after surgery. It can be happen not only because of the sophistication of medical technology today, also not just because of the greatness of the doctors to handle, but it all could be happen because God’s loving hand touched my father through the doctors and I was immediately back to the core, put my hope on God alone. Once we put our hope on God, then we will not disappointed because hope doesn’t disappoint and we will secure because there is hope and we will find the rest in God because our hope is come from God. Put hope of what we do in the Lord Jesus Christ who already sitting at the right hand of the throne of God the Father in Heaven. Amen. Hello, my dear readers! I am so grateful to God could come back again to the blog after been awhile not active do blogging. My post this evening coincides with Good Friday and this post is revision of my old post titled “By His Wound We are Healed” I hope and pray this post could be a reflection for all us in Good Friday. Thank you and God bless. Bible verse above is the prayer of Jesus in the Garden of Gethsemane before He arrested. We all know that is the beginning of the series of Jesus’ suffering. Jesus will experience so many terrible suffering in order to fulfill God’s will. Jesus was willing to commit all that just for us. Supposed we are the ones who receive it all, but it was Jesus who replace all our sins and redeem with His sacrifice. Why Jesus was willing to do all of this? There are three reasons. It all started from how much God’s love to us as He said in John 3:16, “For God so loved the world that he gave his one and only Son, that whoever believes in him shall not perish but have eternal life.” Jesus loves us so much, and He knows very well how great the love of the Father for us, and for that He willing to undergo a series of terrible processes in order to fulfil the work of salvation according to the Father’s will which is given to everyone. All is about love. Because of love, Jesus was willing to replace us and bore all of our sins. Love can move Father’s heart to deliver us from all sins. Jesus loves us so much, and He knows very well how great the love of the Father for us, and for that He willing to undergo a series of terrible processes in order to fulfil the work of salvation according to the Father’s will which is given to everyone. Let us look some of Jesus’ fulfilment. It is written in Isaiah 53:7: He was oppressed and He was afflicted, Yet He opened not His mouth; He was led as a lamb to the slaughter, And as a sheep before its shearers is silent, So He opened not His mouth. What is written in that verse fulfilled by Jesus in Matthew 27:12-14: And while He was being accused by the chief priests and elders, He answered nothing. Then Pilate said to Him, “Do You not hear how many things they testify against You?” But He answered him not one word, so that the governor marveled greatly. Another proof of the fulfilment of Jesus is when He cried out with loud voice at the cross: “Eli, Eli, lama sabachthani?” that is “My God, My God, why have You forsaken Me?” Long time before this happened, it was written in Psalm 22:2:” O My God, I cry in the daytime, but You do not hear; And in the night season, and am not silent” That is all of Jesus’ fulfilment and all the fulfilment marked by His word before He died: “it is finished” (John 19:30) Yes, the fulfilments of God’s wish to save us from perish and move us into the eternal salvation. Jesus completed perfectly a remarkable work of salvation for all of us. The book of Hebrews said, and as it is appointed for men to die once, but after this the judgment, so Christ was offered once to bear the sins of many. To those who eagerly wait for Him He will appear a second time, apart from sin, for salvation. (Hebrews 9:27-28) One for all and forever. Just once Jesus was present in the world as a sacrifice to take away our sins. Later He will come a second time, but no longer to solve the problem of sin, because “it is finished” He did, but to pick us up, those who have obeyed and faithfully loved Him And appreciate what He has done by remaining holy without blemish. My dear friends, this evening, let’s we take a special time to give thanks and heartfelt gratitude for all the sacrifice of Christ on the cross for all of us. Today if we can go to the pure and holy throne of God without fear, if we could hear his voice and feel His presence this time, all of it is the fruit of Christ’s redemptive work. When people give a special gift to us, it means that people love and care for us. It is same as our Lord. He gives us very, very special gift. That is the greatest gift; there is no greater love than this. Jesus, the Lamb of God who takes away our sins. Jesus has completed a series of Father’s will with thoroughly and perfect, so we were supposed to perish now been granted of the eternal salvation. And then make sure to avoid all of Christ’s sacrifice be in vain upon us. Living in Divine truth, be faithful to Him and manifest His love significantly with proclaim god’s love to others. Amen.